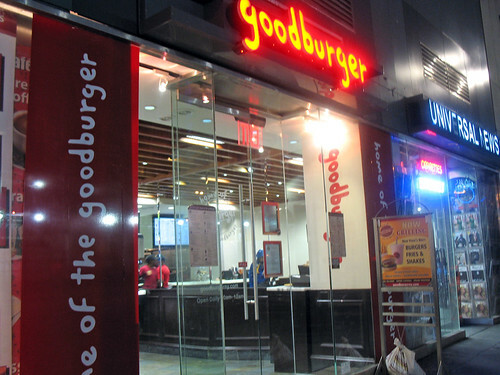 I did not have high expectations for Goodburger – it looks like your standard fast-food chain, afterall. But I have to admit, when I walked up to the counter to place my order, and asked the cashier if the veggie burger was vegan, her confident “yes” took me by surprise... as did her quickness to alert me to the fact that “the works”, which the veggie comes topped with by default, includes mayonnaise, but I could order it without if I wanted the burger to be completely vegan. That’s more like what I had expected from such an establishment as this. Barely-green iceburg lettuce, tomato slices that ranged from “okay” to “not ripe enough to eat”, red onions, pickles, ketchup and mustard. The bun was one of those generic pre-packaged ones, but at least it was whole wheat (another option which the helpful cashier had offered to me when I placed my order) and it was fresh – lightly toasted, but not stale like too many generic buns I have encountered over the course of this endeavor. The best part of this burger was definitely the patty – I was surprised by how good it was, sandwiched between such mediocre buns and toppings. But it was grilled to a crisp on the outside, and warm and soft on the inside, and actually quite tasty. Filled with a mash of vegetables, I could pick out pieces of individual ones to identify: carrots, corn, red peppers, soy beans, and – the biggest surprise – zucchini! Is Goodburger fast food or not? I don’t know – it’s not as bad as other fast food burger chains which shall not be named here…But the interior feels like a fast food place, and with six locations in NYC I think it qualifies. It’s actually a little more expensive than you would expect a burger to be from a fast food place – or at least you would expect that price tag to include fries, which this one does not! 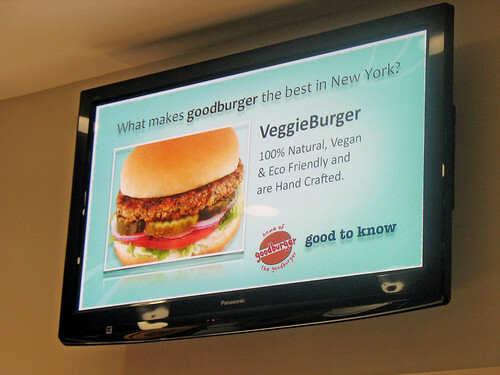 It's not "the best in New York" as their advertising tries to claim, but I still have to say it’s probably the best veggie burger I’ve eaten or will ever expect to eat from a fast food chain. Ha, yup, that was one of my questions but the other thing I wonder about is the bun. vegan too? 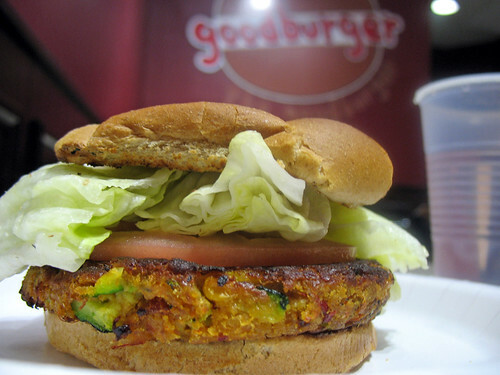 I haven't tried Goodburger yet, but I've been hearing some pretty good things about them. That burger looks pretty freakin good! 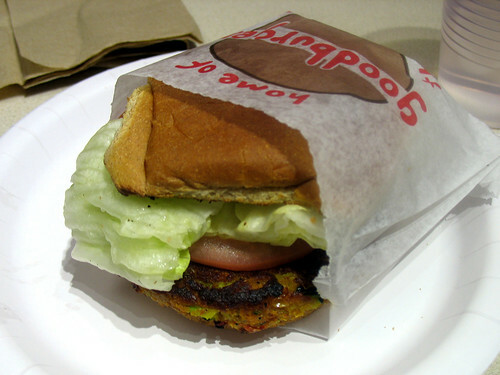 Yes - a separate grill (at least that's what they told me, I did not see it for myself) and the bun is vegan too! Marty: the restaurant location for Goodburger says that the burger *isn't* vegan but the company contact I spoke with sent me the bun ingredients and they were vegan. So, I'm not sure if the buns are vegan. The burgers are loved by my boyfriend, however. Let me know if either of you find out about the bun. The employee I spoke to checked the list of ingredients on the packaging that the buns came in, and said they were vegan. I don't know if all their locations use the same brand of buns or not though. I'm really curious about this. I have a dairy allergy and develop a cough, a rash, and shortness of breath when I ingest dairy. I'm also vegan. 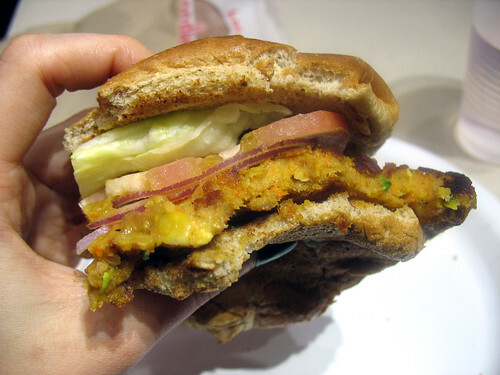 I ordered the veggie burger with only lettuce and tomato. I also got fries and an iced tea. I've been experiencing symptoms I haven't had since I gave up dairy since I ate this meal tonight. They might be able to fool taste buds but my body sure seems to think there was dairy inside. Daniel, I'd really like to know if you contacted the restaurant and found out any further information! Please keep me updated.